Now you can easily integrate your heating system with FIBARO Home Center. Our heating panel enables fast and effortless control of heating in your home with graphic browser interface. In this article you’ll get to know what is a schedule mode, manual mode and holiday mode and how to use each of them. Linked heating devices configured as described in this tutorial. 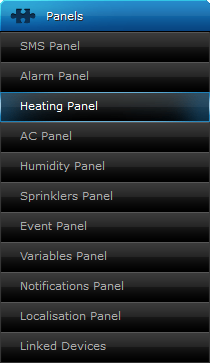 In order to use new heating panel log in to your Home Center and go to: Panels. Choose Heating Panel from Panels list. You can divide your home for heating zones. It will make a heating management process easier and quicker. Click Add zone if you have no heating zones added. Select entire sections or selected rooms and click Save zone. Use sliders for each day to adjust time periods to your needs. Set the temperature for each time period like in the example below. You can also copy settings and apply it to the whole week, working days or just days of your choice. Tick chosen option and click Copy. It is also possible to change hours for whole week at once with Week slider. Click the Save icon after setting the temperatures for whole week and go back to Heating Panel. You will see the list of Heating zones. 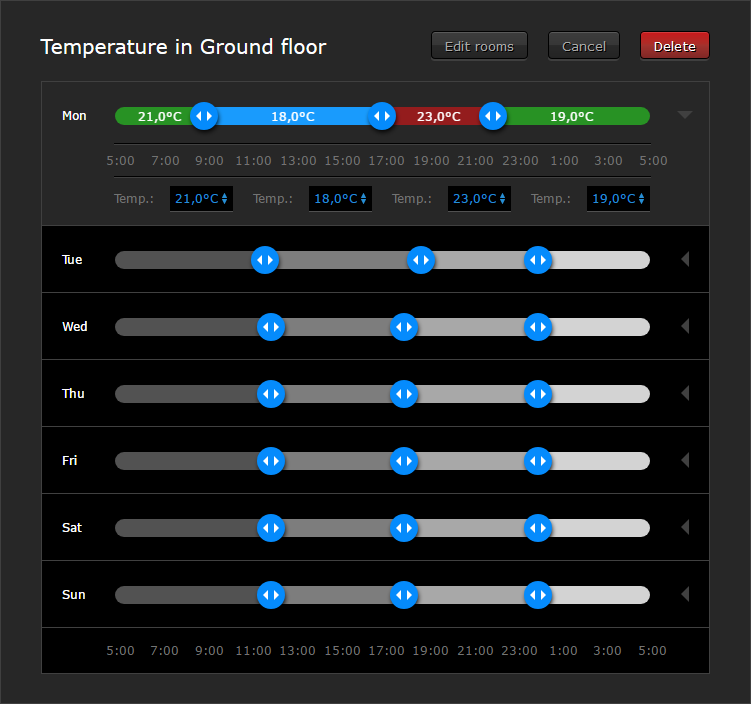 Manual Mode allows to set the temperature in each zone for a specified number of hours. It overrides the schedule until the time ends. Click Configure in Manual Mode section to adjust options. Set the temperature, the time of duration, select your zone and click Turn On to activate. Manual Mode has been enabled. You can click OFF to go back to Schedule Mode. 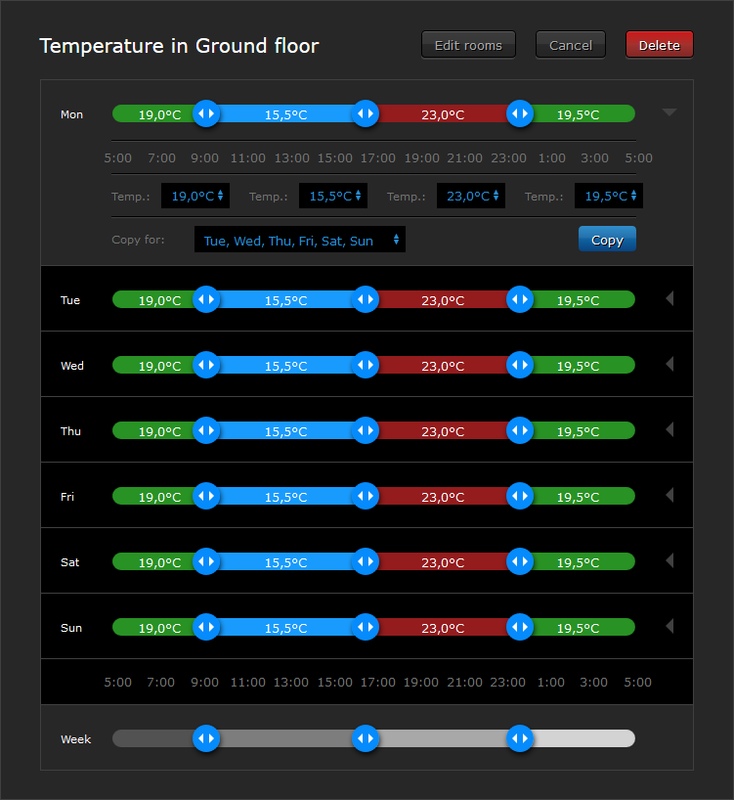 Holiday Mode allows to set the temperature in each zone while away from home. It overrides the schedule until disabled. Click Configure in Holiday Mode section to adjust options. Set the temperature, select your zone and click Turn On to activate. Holiday Mode has been enabled. You can click OFF to go back to Schedule Mode. Clicking Manage allows to edit the schedule of selected zone.